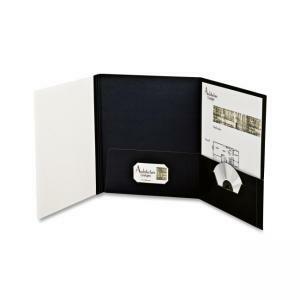 Tri-fold folio cover lets you customize it with your own design. Design and print front cover. Assemble in seconds with built-in adhesive strips. Three-panel folder with two pockets holds 100 sheets of letter-size paper. Back cover is laminated. Front cover has a matte white surface for smearproof printing. Folio cover includes four blank white printable covers, a die-cut CD holder and business card holder.